Click Here to see what sets us apart from EVERY other Chevy/GMC diesel truck repair shop in the area! Quality 1 Auto Service is located in Temecula. We provide full truck service and truck repairs on all Chevy/GMC Duramax diesel vehicles; from minor oil changes to replacement of engines and transmissions. Our clients from Temecula, Murrieta and surrounding cities have come to rely on us for fast, efficient diesel repairs at competitive prices for their Chevy/GMC diesel truck or van. Same day truck repairs on Chevy/GMCs are appreciated by our clients because of this convenience. Quality 1 Auto Service has the experience and training to fix your Chevy/GMC truck properly, the first time. Our ASE trained Master Certified Diesel Technicians use state of the art diagnostic equipment and current truck repair service information to quickly diagnose and perform necessary diesel truck repairs. With all the complex automotive systems in Chevy/GMC Trucks today, experience and knowledge are a must for quality truck repair jobs. Getting your truck repaired quickly and back to you fast is our first priority. Our diesel technicians will give your truck the personalized repair service that it deserves. These are just some of the reasons our clients who drive a Chevy/GMC gladly return to us for their maintenance and truck repairs. 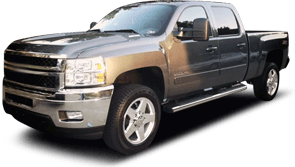 Our Chevy/GMC Truck clients from Temecula, Murrieta and surrounding cities always appreciate the extra benefits that Quality 1 Auto Service provides. A free truck wash with every service or repair, loaner cars available, free high-speed internet in the lobby. Most of all our Chevy/GMC Truck clients really appreciate the long nationwide warranty we provide. Our warranty is: 3 year/36,000 mile on all truck repairs. Our diesel technicians know our repairs are done right using the best parts and can therefore offer this warranty that no other dealer or independent diesel truck repair shop can match. Please give us a call or stop by with your Chevy/GMC Duramax Diesel Truck repair questions or any other automotive questions you may have. We look forward to hearing from you soon.